Mesotherapy is suitable for people who are suffering from hair loss especially active hair fall. As the therapy involves injection in the scalp this therapy works in stimulating hair growth. It is a non-surgical hair loss treatment that requires 8 to 10 sessions to complete. London offers effective and innovative mesotherapy treatment. If you are looking for this therapy then there are many clinics that offer free consultation and help you to find how this therapy works for you. Mesotherapy is a treatment where the scalp is injected with some medication especially vitamins including homeopathic or pharmaceutical medications. The procedure helps in increasing the blood circulation that leads to healthy growth of hairs. It is an effective time-release delivery system that reduces inflammation, improve blood circulation, and increase follicle size to stop hair loss, neutralize excess DHT and stimulate hair growth. Mesotherapy is suitable for the people having partial hair thinning. However, the treatment does not work on those who are suffering from complete hair loss. It is highly beneficial non-surgical procedure that helps hair re-growth. The procedure is done by injecting FDA approved ingredients such as vitamins, minerals and proteins into the scalp so that the blood circulation to that area will be improved and give a vitamin boost. To get better results one should take 6 to 8 sessions of this therapy. People with diabetes, skin ailments, haemophilia, dermal infections and pregnancy should not opt for mesotherapy treatment because it may deteriorate or hamper their health condition. However, if you are unsure then you can make an appointment with an expert. There are many surgical experts available in London that can not only give advice but also discus alternative treatment options with you. Mesotherapy can be used along with other treatments. As it is considered an extremely safe treatment one can use Minoxidil and Finastride simultaneously with this non-surgical procedure. Mesotherapy is a baldness treatment that allows hair to grow. The treatment is suitable for men who are suffering from male pattern baldness, patchy hair loss, etc. Mesotherapy treatment for hair loss is suitable for women who are suffering from thinning hair or patchy hair loss. Discontinue taking Disprin, Aspirin or Ecosprin. To minimise discomfort one may apply anaesthetic gel 2 hours before the procedure. Avoid taking certain vitamins 3 days before the treatment. No recovery time patient can resume work straight away after the procedure. Swelling or bruising for 48 hours in the treated area. Anti-inflammatory medicines can be used if the patient feels any discomfort after the treatment. Mesotherapy is a minimally invasive, non-surgical and pain-free hair loss treatment that involves injecting specially prepared ingredients into the scalp. People suffering from hair loss in London have various options to opt for as there are many clinics offering mesotherapy. 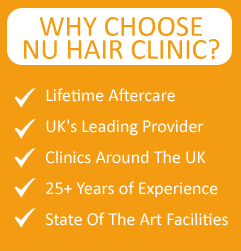 Nu Hair Clinic in London offer not only non-surgical procedures but others as well. To know the cause behind your hair loss problems and to get proper treatment Nu Hair Clinic is the ultimate destination to opt for.